Like most people, Im constantly on the hunt for white teeth. If I had the money I'd get a full set of veneers, but until then Im stuck with highstreet bleaching (I've never had but its really unsafe and I really dont recommend) or home treatments. I've used lots of different things over the years to vary degrees of success. I drink way to much coffee and coke and I wish I could just stop as I know my teeth are suffering but I'm just addicted. I think as well that my teeth just naturally aren't that Hollywood white smile I really want. Crest White Strips seem to get rave reviews over in the States so naturally, I had to try. I've tried both the normal white strips that you use everyday as well as the Two Hour Express ones. You cant actually buy these in store the UK at the moment so I tend to buy off ebay sellers. You can get them from the UK or US sellers, depends on who your comfortable buying from. They are really easy to apply, are not particularly uncomfortable to wear. I tend to use 2 Hour Advance strips once every 3-4 months then use the regular ones once a week. The Two Hour strips are for a harsh bleaching process. I find they do make your teeth quite sensitive the next day even if you don't have sensitive teeth. But the uncomfortable feeling does go away after a few hours. They are intended for maximum whiteness in the shortest amount of time. 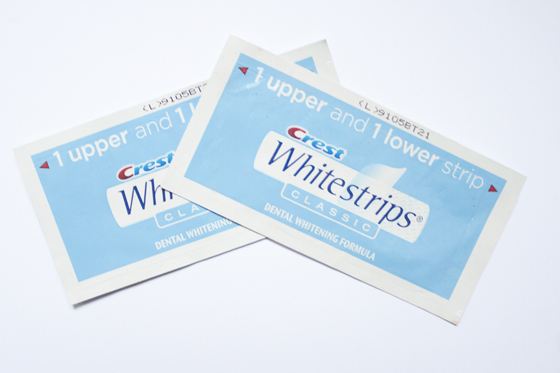 The regular white strips aren't as harsh, but you don't get results as quickly as you would do with the 2 hour ones. Your supposed to use the regular ones everyday, but I think its quite hard to actually remember to put them on. When I was at uni I used to wear them on my drive to Hereford each morning! But its so easy to forget. I wouldnt recommend these at all if you have sensitive teeth. However I can confirm they do actually work and you can definely see the improvement in your teeth colour time. I havent achieved as white as I'd like and highly doubt I ever will until I pay up and get them whitened professionally!But these are good if your on a budget and can deal with the uncomfortable-ness for a few hours after using them. It's strange you wrote about these today, because I have been using white strips since Christmas. I got them from a UK seller on eBay. I have really noticed a difference in the colour of my teeth and will definitely keep using them! My teeth are sensitive, and they hurt for a bit but nothing too bad! I always want to try them, but i can't aahha im such a coward. Thanks for this review and the link! I wouldn't say I have yellow teeth, but like you, I like lots of things that discolour my teeth; and am glad to hear your thoughts on these strips as I've been curious about them for ages. Ever since having my brace off I've wanted to try some white strips. I used to use the daily ones. I hated them, I may try the two hour ones and then pick up some sensodyne too paste. Glad to hear they work just as well. The Crest 3D Advanced whitening strips are fantastic if you can get your hands on a set of those, a little more expensive at $40 but so worth it. I use them weekly rather than daily because they do work almost instantly. To follow try and get some of the 3D toothpaste as it's by far the best whitening toothpaste i've ever used. They leave my teeth amazingly white and with very little sensitivity. Tempted to give them a try, but my teeth are so sensitive at the minute I don't think it'd be a wise idea!! I might just try the two hour ones once and see how bad it is..
i personally saw an improvement with these as well, but you're right they make your teeth uber-sensitive, which makes me question if they are good for your teeth... and also, they taste horrendous! I've also heard some really good thing sabout Crest White stripes. I've never tried them personally probably largey to do with putting the quest for white teeth quite far down my list when it comes to beauty goals :/ But I'd still love to try them one day. Hmm I think i might give these a chance, I've been considering professional teeth whitening but it's not exactly within my price range and after trying products like Pearl Drops I've just been disappointed. I used these quite a few years ago and I think they're brilliant, I haven't had to use them again since as my teeth have stayed pretty white.